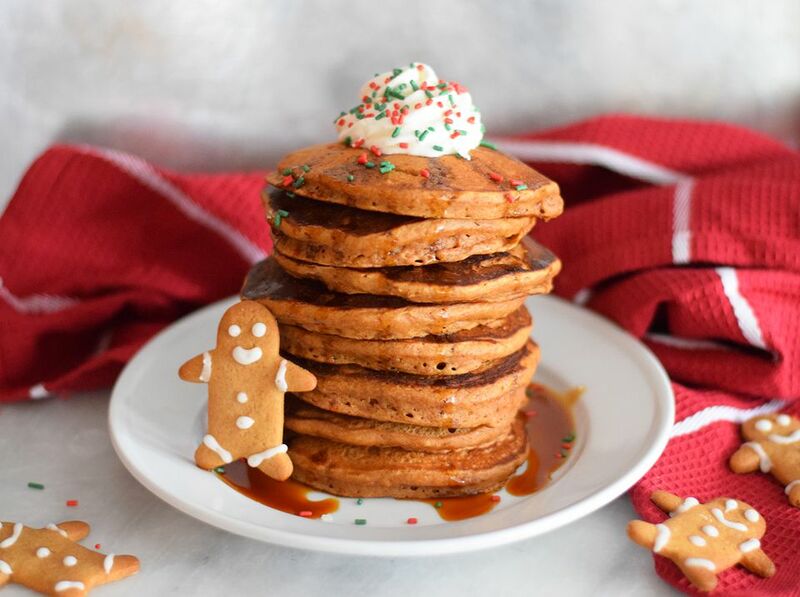 Bursting with holiday flavor and easy to whip up in no time at all, these fluffy gingerbread pancakes are the ideal Christmas morning breakfast. They're much easier to put together than the classic Christmas cookie, but taste just as delicious thanks to all the warming spices. Pancakes are always fun to make with kids and this recipe is no different. Add festive red and green sprinkles to your regular round ones or follow the directions at the very bottom to see how you can use a gingerbread man cookie cutter to make them in the shape of little people. Silver dollars are also a cute option and you can even decorate the pancakes with a little royal icing if you want them to look like the holiday cookies. Whisk together the flour, baking powder, salt, sugar, cinnamon, cloves, allspice, and ginger together in a large bowl until they are completely combined. Melt the butter in a liquid measuring cup, then add the molasses, milk, vanilla extract, and egg. Beat the ingredients in the measuring cup until everything is completely combined. Add the wet ingredients to the dry ingredients and whisk until there are only a few lumps. If the batter is too thick, thin it out by adding a tablespoon of milk at a time. Heat your griddle on high heat and then turn it down to medium-low once the whole griddle has been preheated. Add a 1/3 cup of batter to the griddle for each pancake. Head for about 1 minute per side or until golden brown and cooked through on both sides. Keep the pancakes warm on a baking sheet in a 200 F oven while you prepare the molasses syrup. Whisk together the molasses with the maple syrup in a small saucepan. Cook until just heated through. Serve the syrup over the pancakes along with whipped cream and sprinkles. Finish with a dusting of powdered sugar if you wish. Grease a large gingerbread man cookie cutter with non-stick cooking spray. Place it on a hot griddle and allow it to heat up for a minute or two. Add a small amount of batter and allow it to spread into the arms and legs. Add a little more to the appendages if you need to. You don't want the pancakes too thick though, because then they will pool out of the mold and won't be able to hold their shape. Carefully remove the the cookie cutter once the batter has set. Flip the pancake and cook for another minute or until golden brown.